A classic Hallowe'en variety, with upright shape and classy appearance. Good deep orange colour and strong handle; well defined ribs. Fruit typically 6.8-11.4Kg depending upon number left on vine. Produces a high yield. Intermediate resistance to powdery mildew. Pumpkins are a group of winter squshes, normally characterised by their vibrant orange skin. The Hallowe’en pumpkin market is as popular as ever. Relatively easy to produce, with good storage qualities. Also gaining popularity for its culinary uses. Good for young plant sales and for P.Y.O. use. 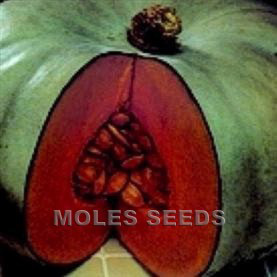 4-10 seeds per gram. Germinates between 15 and 30°C. Sow from late March-May into modules, or June direct. Spacing 90-150cm x 180-240cm. Harvest from July to October. Stopping the plants with only 2-3 fruits on the the vine will result in bigger fruits. 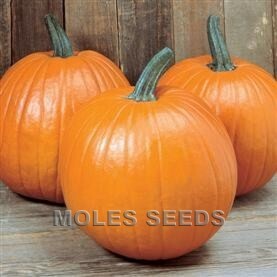 Pumpkins can be ripened off the plant. 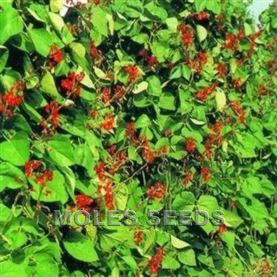 All our varieties are vine types unless stated otherwise.